NETWORK FINALS: ABC’s NBA game adjusted to 1.0. Elsewhere, the NFL HONORS special and the rerun 48 HOURS lost 0.1 in final numbers. 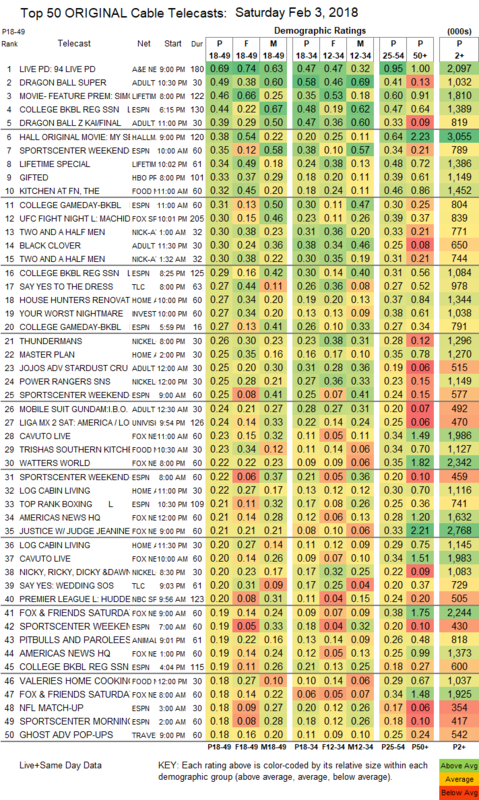 CABLE HIGHLIGHTS: A&E’s LIVE PD easily topped Saturday cable, down 0.07 to 0.69. Adult Swim’s line-up performed as follows: DRAGON BALL at 0.49/0.39 compared to last week’s 0.42/0.33, BLACK CLOVER up 0.06 to 0.30, JOJO’S BIZARRE ADVENTURES up 0.05 to 0.25, MOBILE SUIT GUNDAM up 0.06 to 0.24/492K, HUNTER X HUNTER up 0.06 to 0.24/470K, NARUTO up 0.03 to 0.23/469K, OUTLAW STAR up 0.04 to 0.20/420K, SPACE DANDY up 0.04 to 0.19/383K, COWBOY BEBOP down 0.02 to 0.18/360K, and GHOST IN THE SHELL down 0.03 to 0.15/307K. Lifetime’s movie THE SIMONE BILES STORY was at 0.46, with the follow-up documentary special at 0.34. ESPN’s COLLEGE BASKETBALL doubleheader was at 0.44/0.29. Hallmark’s movie MY SECRET VALENTINE was at 0.38. On Food Network, KITCHEN AT FN rose 0.04 to 0.32, TRISHA’S SOUTHERN KITCHEN ticked down to 0.23, and VALERIE’S HOME COOKING was down 0.02 to 0.18. Fox Sports 1’s UFC FIGHT NIGHT was at 0.30. TLC’s SAY YES TO THE DRESS held at 0.27. HGTV’s HOUSE HUNTERS RENOVATION dropped 0.05 to 0.27. ID’s YOUR WORST NIGHTMARE lost 0.04 to 0.27. 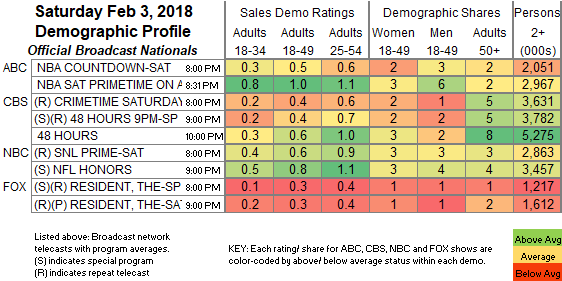 On BBCAmerica, BLUE PLANET and its follow-up were at 0.18/0.17, compared to last week’s 0.20/0.19. USA’s FALLING WATER held at 0.13.